← California Trains – Part 1, Southern Cal. 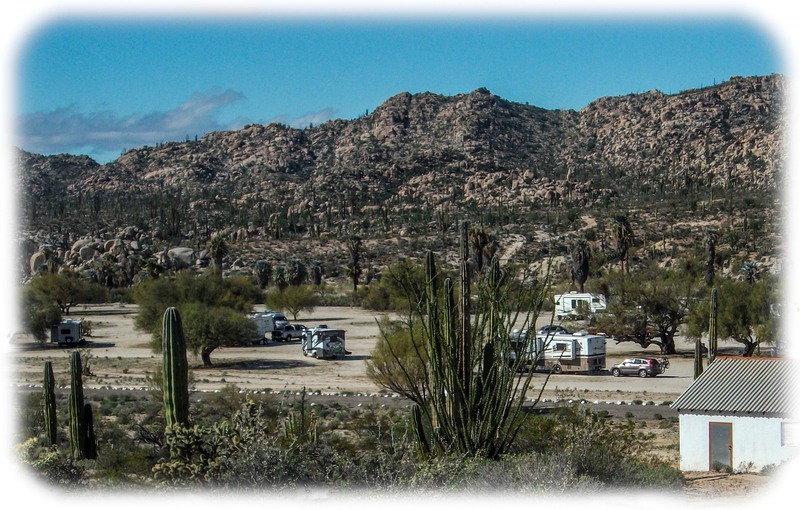 Our great Baja California Mexico tour with John and Becky of Baja Winters began at the KOA in Chula Vista CA, USA. We met and introduced ourselves to our new friends, then traveled to the border for our 6 month tourist card and to buy pesos. We exchanged 1USD for 18 Mexican pesos. Day 1, 29 Enero 2016 we had an easy crossing at Tecate. Some of the group of 13 RVs missed a turn and had to find their way back but overall it was an easy start. We all have CB radios and a handle. Our handle is “Greenman”. We visited a wine museum before setting up camp at Sordo Mudo RV Park, an interesting basic campground run by a school for the deaf. We learned it was the primary school for deaf children in all of Baja and survived on donations. We all contributed something in addition to the camp fees paid by John and Becky. 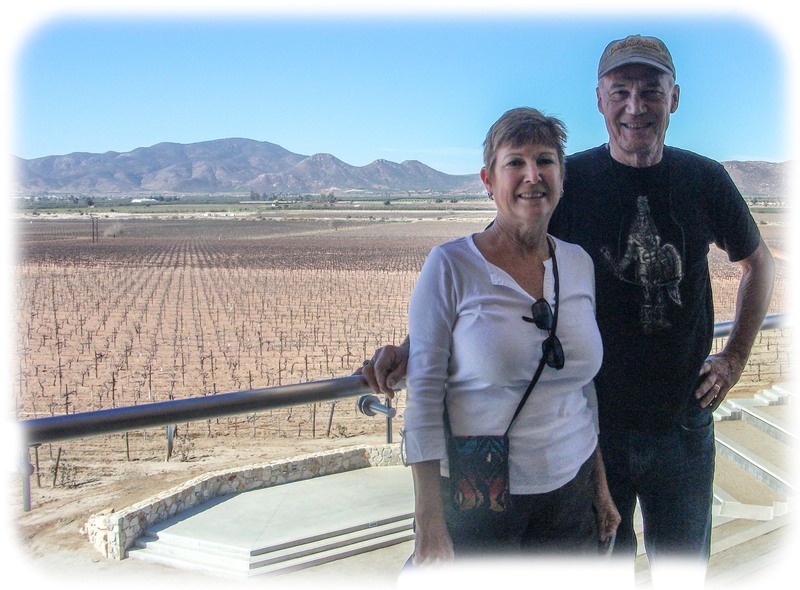 A group of us visited L.A. Cetto winery nearby for a tour and tasting. 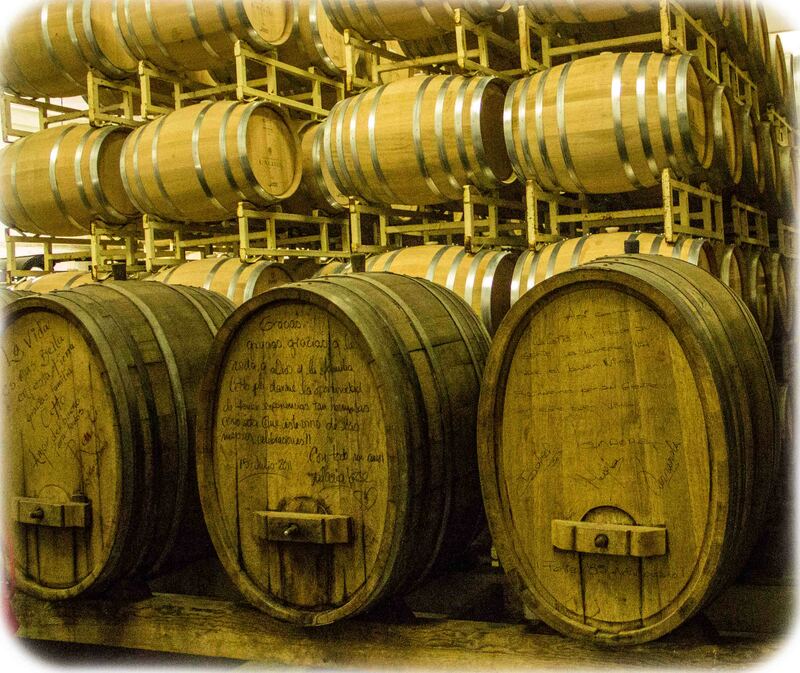 They are a huge winery, the largest in Mexico. A friendly Baja Winters provided chicken dinner and pot luck rounded out a great first day. 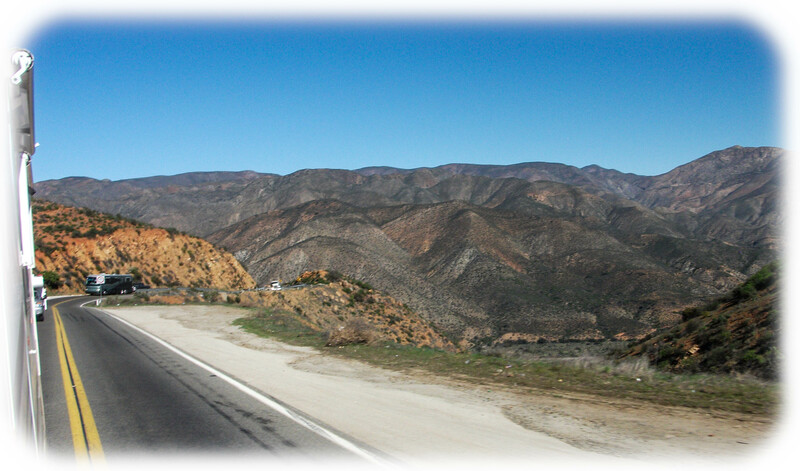 Day 2, 30 Enero, we continued south joining Mexico highway 1 at Ensenada. 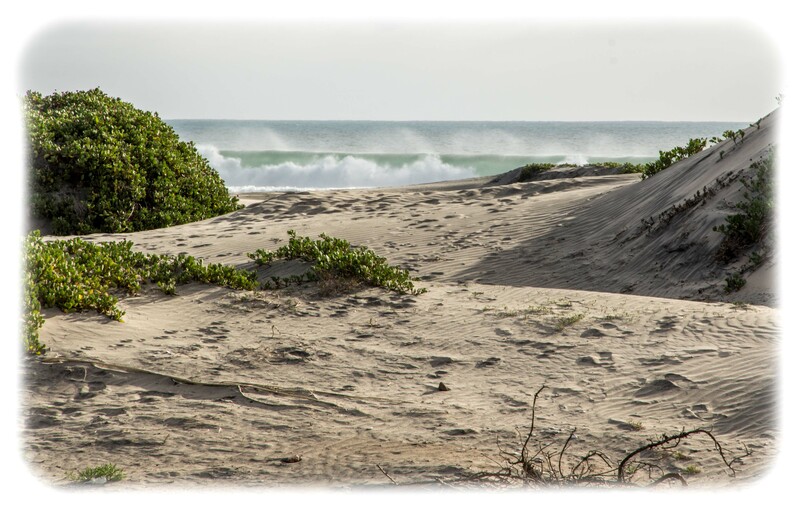 Then we camped just inside the dunes on the Pacific Ocean at El Pabellon beach. John and Becky supplied margaritas and tamales and we had a great campfire of mesquite wood. It was pretty cool and breezy. More potluck dishes made it great. Day 3, 31 Enero. 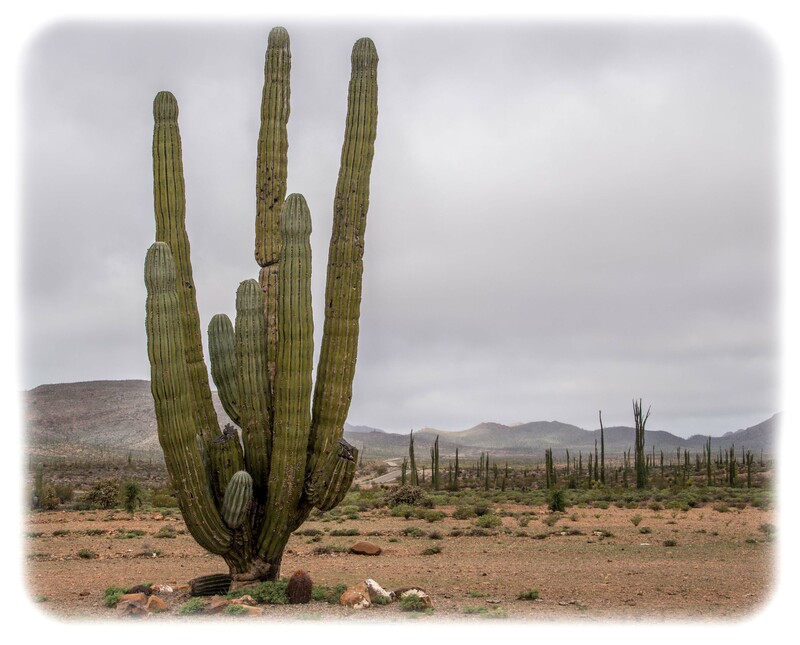 The carvan entered the cactus and boulder country of Baja’s badlands. This area is very sparsely populated with beautiful landscapes everywhere. 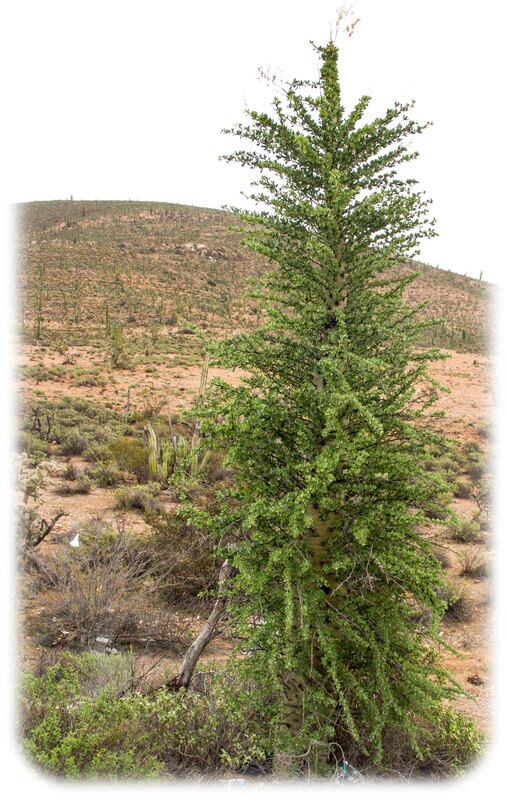 We camped near Catavina on a rancho. 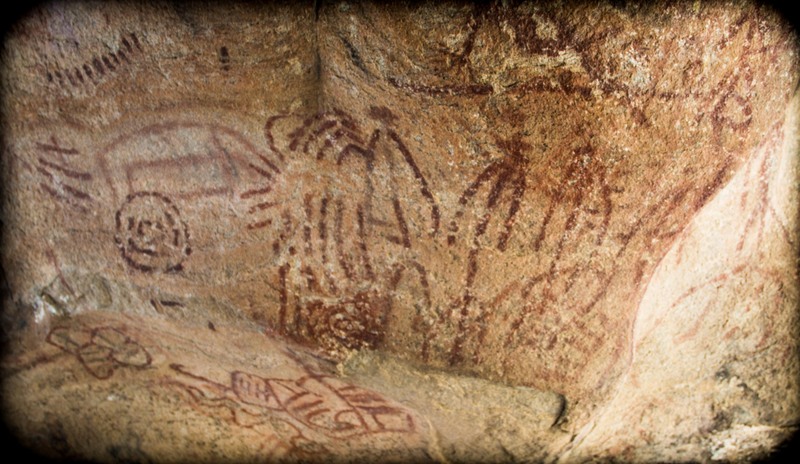 After we set up we had a tour to some spectacular cave paintings and a botanical guided walk. That night we had high winds and rain and the temperature dropped 20 degrees. Baja winter! OK, we can handle this. By now we are getting somewhat used to the roads of Baja. Lanes are only 9.5 feet wide with little or no shoulder beyond the white line. Sometimes the white line is gone! Its still nerve wracking when a tractor trailer or tour bus approaches. 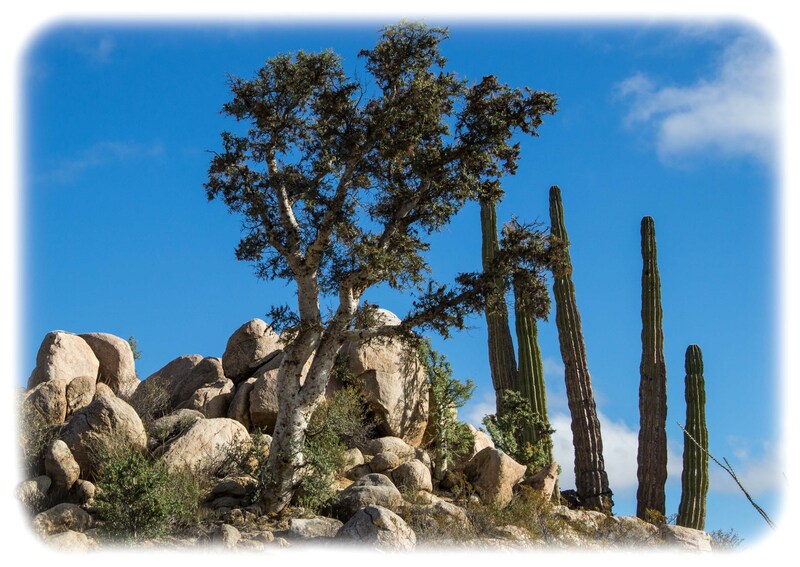 The landscape in this area is truly a fantastic mix of extreme cactus and thorny desert trees along with exotic shaped granite bouders. 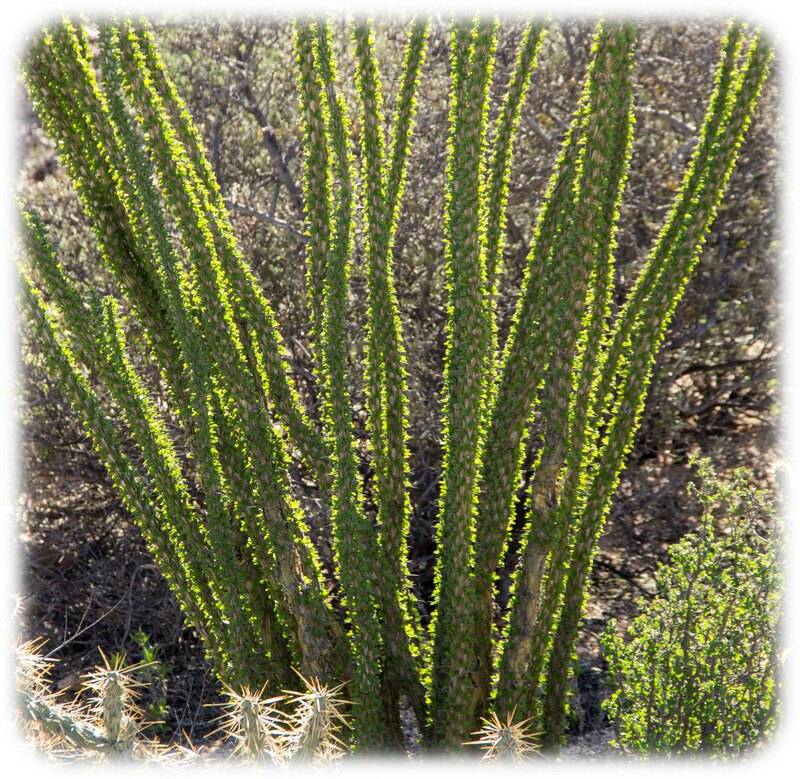 The featured plants include the Boojum Tree and the Cardon Cactus, both very unique to Baja. 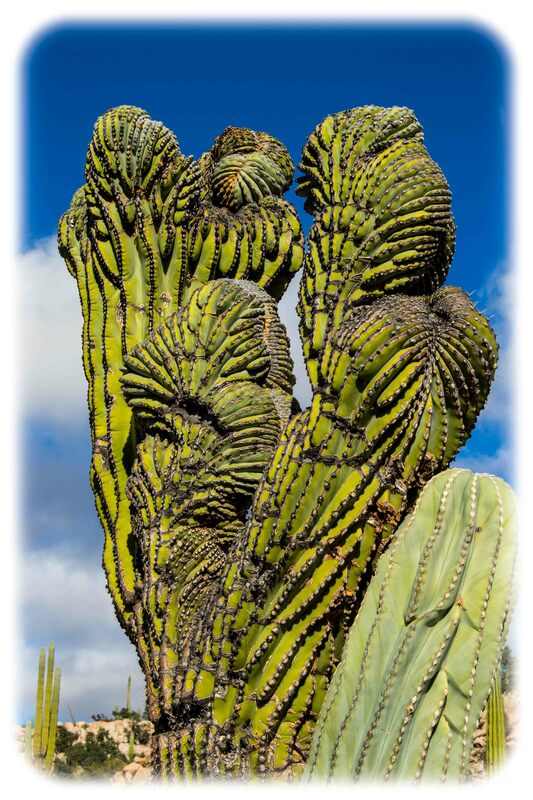 This entry was posted in Mexico, RV Travel and tagged Baja California, cactus, desert, Oasis, RV camping. Bookmark the permalink. Why does the CB handle not surprise me? Looks like an awesome start to the trip. Anxious to see later updates. 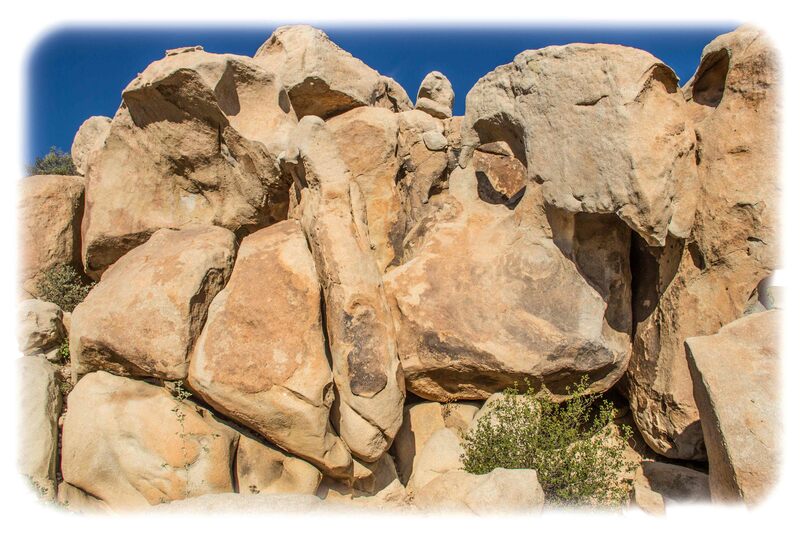 Looks like a fun experience – interesting to see the sights in your photos. 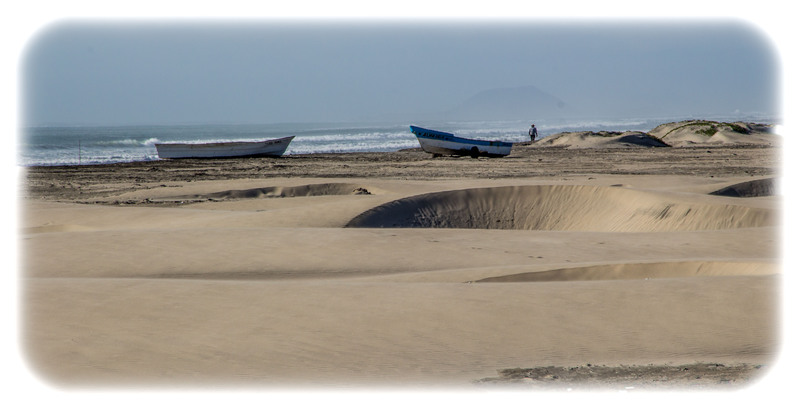 I love Mexico, but have never been in the area you are (except for a quick trip across the border one day years ago to Ensenada). Looking forward to more reports. So happy for you two! What a wonderful trip. Thanks for sharing your tales and pictures! Love the sparse vegetation. Neat shapes and textures. Safety in numbers is probably a good thing.